In this presentation I am concerned firstly with some of the implications, for understanding and analysis of what I call "mixed-mode" performance practices (including pre-recorded elements), of a training in the arts of writing; secondly with what those of us who are writers produce, ostensibly 'about performance', when we draw on discursive conventions which range from use of the ontologising verbs 'to be' and 'to have', through nominalisation (as though in performances' name), and to commonsensical – as well as 'expert' – uses of metaphor. I shall argue that writing 'about' performances tends to be writing which reproduces spectator (or listener) theories of knowledge, as though these were "performance theories"; whereas what might well be at stake, in the institutional dispositifs (or set-ups) which bring together performance-making, performances, and spectators, are curious "events", which "lie[…] at the intersection of at least two (and in reality many more) process lines". "[E]xperience" in the event, writes Brian Massumi, "never stops 'streaming', and its streaming snowballs", with similarly curious implications for those concerned to identify – for example – "its meaning". I draw on accounts of one or two instances of mixed-mode performance events (and one or two accounts of performance writing), in order to argue that the orders which regulate (performance) writing tend to be incommensurable with the "autonomy of experience" of individuals caught up, as practitioners, in certain performance events. The consequence is that each instance of performance-analytical writing constitutes no more than a momentary and imperfect instantiation of a fragment of an experience, which means that writing's struggle is endless. I want to begin in terms of the ways the university approaches the issue of arts-disciplinary expertise – and, in fact, of performance-professional mastery – for the simple reason that performance expertise has hardly figured in writing on performance, not least in what is called Performance Studies, over the past three or more decades. I have, on the basis of what I judge to be a widespread failure to refer in writing to performance expertise, described Performance Studies as a closet Spectator Studies, which does not speak its name, in spite of its widespread and very democratic appeal. I have argued that closet spectator studies, marketed as performance studies, encourage widening participation, to the extent that they do not require evidence of performance potential in terms linked to disciplinary training, whereas performance training itself tends to be selective, hence excluding, at point of entry. I have argued that in many instances Performance Studies colleagues both nationally and internationally are actually teaching "expert spectating", in the university, but that we also fail expert spectating by refusing to own it as such. I have made a number of general arguments in this regard: first, then, that those who write ostensibly 'about performance' are generally writing in fact about the spectator experience of performance; that we teach them to do so on the basis of the (naturalised) presuppositions specific to a spectator theory of knowledge, and from a spectator positioning within the performance event. I have sympathy for Keith Howard's argument that ethnomusicologists tend to be practitioner-observers, but mindful of the reflections emerging from within what has been called the "ethnographic turn", which is that practitioner-observers continue to be encouraged to interpret practices, rather than merely 'thickly describe', and to do so in terms of dominant interpretative apparatuses preferred in the universities. I have invoked, in this sort of context, the notion of relationality, which some of you will recall from writings on the work of Charles Peirce, or from more recent writing on – for example – what has been called the "ethnographic turn" in the work of certain art practitioners: in relational terms the analytical writer's positioning, with regard to art practices or performances or 'the art work', is key to the sorts of observations she can produce; key, in addition, to any stance on that old familiar friend, 'meaning production', and how that production might be grasped on the basis of the application to performances of interpretive models borrowed from other disciplines. Similarly, I have argued that this sort of application, in the name of meaning production, has tended in relatively recent history, to encourage many of us to ignore aesthesis in favour of signification, not least in the case of theatrical or staged performances. But I have equally noted that the majority of those who claim to theorise performance tend to do so not just on the basis of a belief in writing, but on the basis of their own writerly habitus, to borrow from Bourdieu, and of the sort of "cognitive mapping", to borrow Jameson's borrowed term, which might be argued to be specific to the professional writer-educator, to her ways of seeing and doing. By way of contrast, I have recently suggested that the expert performance practitioner tends to engage with performance-making problems, firstly through the operations of what I call expert intuition, which are unavailable as such to expert spectators; secondly through affective and teleoaffective investment, thirdly through speculative engagement, collaboration and ongoing negotiation, and that these are difficult to engage with in traditionally authoritative registers of writing. Fourth they engage through access to what might be called the logics of professional performance production and production values, which are often expertly intuited by professional practitioners, rather than articulated verbally; and fifth through a grasp of performance-making strategies which tend to be multi-dimensional, often multi-participant, rather than writerly or writing-like. I have argued that the 20thC "anti-aesthetic", coupled with the "pedestrian turn" and the "everyday life turn", of the 1980s and later, have caused some spectators to misrecognise performance expertise as such. And I have suggested, in addition, apparently contentiously, that some expert practitioners theorise in and as expert practice, without necessary recourse to writing or writerly discourse registers; but that until enough of us in the university accept that theoretical practices more generally are not necessarily identical with the writing which tends in the university to serve as their vehicle, we will be unable to understand how that mixed-mode theorisation works, and precisely what can be theorised through expert practice. Can these sorts of critical observations be transferred to the context of music performance? Can it similarly be claimed that a listener theory of music, and the presuppositions specific to a listener theory of music, will tend to produce observations which are out of line with those specific to a music practitioner theory of knowledge? I wondered whether expert listeners are similarly encouraged to attempt to infer causes of music-making from listener-effects – along the lines of, for example, "Beethoven's heroic struggle", or "Schubert's brief intensity"? You may be aware, in these sorts of terms, of critical observations coming from that branch of philosophy called speculative pragmatism, including the suggestion that certain traditional understandings of scientific method are articulated in a "formalized deductive model of scientific explanation that allows for verification by operations of testing, but cannot grasp or deal with any process by which ideas are generated" (S. Rosenthal, 1986: pp.9-10). It has become clear to me, over recent years, that analytical writing in music – as distinct from writing in critical ethnographic registers, perhaps – may not have had to deal to the same extent with the hermeneutics of suspicion which has been applied via the discourses of critical theory to many areas of Performance Studies; nor perhaps has music practice been so consistently interrogated through the interpretative apparatuses specific to Ricoeur's hermeneutics of suspicion which he traced back to the Marxist and Freudian traditions. There seems to me to be less emphasis, in analysis of music practices or 'musicking', on critical theories of representation, than there has been in either theatre studies or dance studies. On the other hand, it is precisely because of the attempt of historically-important music-analytical writers such as Jean-Jacques Nattiez, to identify – indicatively – the relationship between music universals on the one hand, and how music is generated in culturally-specific terms, that I have concluded that there are certain issues, enquiries and procedures which we share across our different disciplinary fields. Arguably all of us here do meet, in writing, in a sometimes naturalised writing production, using a limited range of authorised registers; and on this basis, we share some of the problems specific to the identification, in the written clause itself, first of subjects, second of process types, and thirdly those subjects' predication. We may also meet in the possibility that some 20thC music studies writers, like performance studies writers, suffer to some degree from the inability to deal with the expert or professional music practitioner as such, as distinct from "music" more generally, or a generalised and anonymised "human musicality". On this sort of note, by the way, when J-J Nattiez cited Blacking, from 1973, on the question "how musical is man? ", I was obliged to reword Blacking's question, to read "how musical am I? "; and my response was that while I can listen carefully to music, but not read or play it, I also lack a professionally-trained ear. 1. Whose discipline is it anyhow? 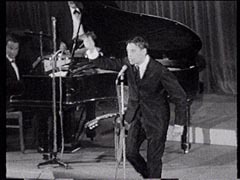 The use of pre-recorded music, in these sorts of instances, is technically-speaking performative, in that it is used in large part to trigger in spectators their necessary contribution to character-psychologising knowledges, which the practitioner team, working within the economy of theatrical production, has no need then to figure in detail as such. In terms of art effects and causes, I clearly could not predict this sort of artist-specific choice, in the 1990s – not least because it involves 'qualitative transformation' (Massimi 2002) of certain established options in available systems; but I seem to have few difficulties in recuperating the choice after the event, on the basis of some sense of empirical fit – between the invention and my already-existing knowledge of the discipline, which I mediate – which I would argue works through hypotyposis. I am plainly testing performance effects perceived against disciplinary expectations, despite the fact that those expectations themselves have been conditioned by Lloyd Newsom's and Simon McBurney's invention. Working from my perception of choreographic and staging decisions taken, then, and through recourse to my already-existing grasp of the various grids or dispositifs (set-ups) specific to the institutions and technologies of theatrical performance, I am attempting to explain the compositional particular on the basis of my grasp of the disciplinary general; but by doing so I am actually side-stepping that other aspect of expert-performance making, which is the singularity of LLoyd Newsom's and Simon McBurney's invention, at a particular historical moment. Looking back to the moment of my surprised apparent recognition at their initial emergence, when I suddenly sensed schematic and symbolic 'fit' between some at least of their choices and my disciplinary expertise, I began to wonder whether it might be appropriate to identify some of these choices in terms of 'noetic creativity' (Rosenthal pp. 10-13), fed by intuitive, discipline-specific, professional or expert creative practice. My concern with expert writing goes further, however, and includes a preoccupation with the way in which certain expert writers also draw on commonsensical registers whenever particular 'knowledge difficulties', seem to undermine what are otherwise the expert or technical registers which they bring to bear on their attempts to engage with a disciplinary expert practice which remains steadfastly outside of writing: I have already mentioned Nattiez's paper, which includes a number of commonsensical, spatialising metaphors – "behind", "between", "beyond", "beneath", and "underpinning" – within what otherwise seem to be a sustained use of expert-technical analytical register. I shall assert that Nattiez's apparently casual use of these sorts of metaphor signals a positioning, with regard to the outside of writing, and to an apparently music-determining outside, which troubles the precise nature of his enquiry. I want to consider very briefly the impact of the notion of event on issues linked, still, to the question of the production of meaning in performance. In this regard you may recall, from my abstract, Massumi's observation that "experience" in the event, "never stops 'streaming', and its streaming snowballs"(5). It "never stops streaming", in fact, wherever the operations of schematic or symbolic hypotyposis are at work – by which term I refer to what might be called "sub-semiotic" particles at work in performances and between performers and spectators or listeners, as distinct from the more generally-used term "the sign". I have said elsewhere that there is "no such 'thing' as 'the sign'". Instead there are large and little sites, where something might – or might not – happen, for someone. 2. Your event – or mine? In Pluhar's interpretation of this tradition, hypotyposis is at work in the application of the rule for a concept (the schema) which is capable of being exhibited, to another concept, one not capable of being exhibited. In Paul de Man, meanwhile, approaching the same phenomenon from a literary perspective, hypotyposis involves that figuration "which makes present, to the senses, something which is out of their reach, not just because it does not happen to be there but because it consists, in whole or in part, of elements too abstract for sensory representation". I am particularly interested, on the basis of the de Man account, in the implication I draw, which is that 'effective' performances are economical, to the extent that they are able to draw on certain sorts of intensified patterning, whose identification, in listeners or spectators, not only expands, but brings with it complexities which, although absent as such, might seem then to a viewer or listener to have been present at source. Whereas at source, the professional practitioner may well have used expert intuition as tool to identify these, within a disciplinary dispositif, with no recourse whatsoever to writerly discursivisation. When Brian Massumi writes then about the event – hence, from my perspective, about performances – he is concerned to note that "in addition to the ingredients" involved in setting up the possibility that something will happen, we also need to identify "their interaction and …effect" (221). That event will seem "to ha[ve] something" that "the ingredients themselves don't have", which is "an ability to do without [those ingredients]". "But", Massumi adds, "there is no general event", no "general conditions of the event". "There is only this event", and what might be termed the technology of the event, which I would argue in many contexts where we experience what seems to be an art-effect and its affects, "is also a technology of the self and a technologising of the self" (55). However, one aspect of that technologisation of the self is that it is experienced as singular, on the basis of its catalysis, where that catalysis depends significantly in turn on the input to catalysis of individual experience. I am supposing that the sense of self engaged also tends, in the event, to operate through what has been called "collective individuation", although this is difficult to provide evidence for as such. To the extent that the art-effect is singular, then the event itself needs to be seen as self-varying; hence although one might be tempted to speak of the construction of the event, in fact the event "recombines found…elements or fragments", with "the unfolding of an absolutely singular worlding relational whole", to such an extent that any sense of the performance "whole" can't actually be given. "Catalysis", Massumi observes, "involves resituating variation – a very different proposition from contextualizing things". And "although the relational whole does not appear outside an actual, situated expression of it", Massumi adds, "it is not reducible to its situation". I want to quote at this point from two performance events which were, for me, highly charged, indeed singular: the first took place in Flanders, in early autumn in 1970, in the course of what was my first cycling visit to Belgium, while I was living in Paris; the second took place in the concert hall at the London Barbican, in January 2003. My first quote of a fragment of an event involves the work of a signature practitioner and a live event, recorded initially in b/w on film, and marketed now in VHS format. It involves spectacle, as well as live music performance; and although the singer undoubtedly performs an already-established persona, it doesn't seem to me that many of the categories specific to an analysis of "theatre" or "theatricalities" are useful in my attempt to grasp its operations. 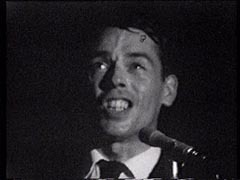 There is a curious neglect in performance analytical terms of Brel's performance work. His art, more generally, is approached in France in terms of poetry, rather than music, and his live performance of these rarely rates a mention. The songs themselves have been published without musical notation, even though they are sung, and as such participate in the French chansonnier tradition. 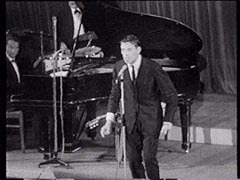 There are some few references to Brel's work in Dauncy and Cannon's Popular Music in France from Chanson to Techno (2003), even though Brel was Belgian rather than French. In that same text (and elsewhere) Richard Middleton has taken up Hennion's observation (1990) that the 'thick description' of such popular phenomena might lead to production of a "musicology of society", rather than a sociology of music. The musicology of society will surely include the sorts of contingent factors I reference briefly in this paper, as well those related, more systematically, to the historical as well as place and role in the social spheres. 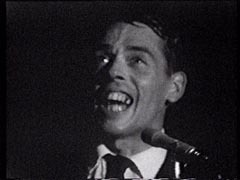 My own evidently less popular concern remains with the issue of performance professional mastery, and what, in Brel's case, might be learnt about it. It may be that the music-writing-popular Gestalt theory might be of some use in terms of an engagement with performance composition and operations; on the other hand, I am not sure that this 'device', for all its charms, would do more than lead us in circles around the object of our analysis. 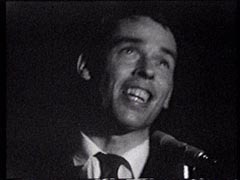 My own preoccupation with the VHS recording of Brel's work may largely be a matter of its apparent ability to trigger for me a sense of 'something in the air' – a semiotically-delicate figural notion, to the extent that I cannot identify "a sign" to re-present it. ("Something in the air" needs to be identified in terms of a sub-semiotic figuration, of flickering particles, such as we find intimated in references to "atmosphere", hence the interest in "hypo-typosis".) 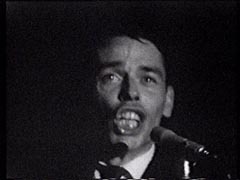 I am more generally interested in Brel's aesthetic ownership of his collaborative performance; in signature – and how this might be im-pressed into expert practices; in his expert ability to compel and capture spectating, to bind me in to its detail to which I lend a particular attention; in the relative resistance of his expert practice to general theories of performance. Perhaps I might simply say here that his expert performance practice is internally differentiated, in compositional terms; is internally complex, in terms of the ways in which this particular artist works with affect and kinetic energy, while conjuring up a little poetic universe through positioning, gestuality, facial expressivity, movement, vocal complexity, kinetic energy and drive; in terms of the ways his work to the audience and/or to the camera, seems to mix together the wholly conventional and the wholly singular. Many of these terms lack precision in my uses of them. I have also found, however, in my use of this audio-visual (VHS) account, that I attend more carefully to song, singer, and the expert practices of the other musicians, while the performance captured visually saturates my looking. Now to the more recent event, which equally involves male voice: imagine for me, if you can, the situation in which this event occurred: it is part of Philip Glass on Film (Live). 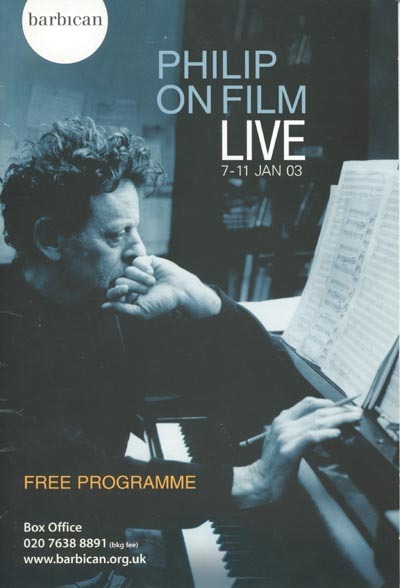 In the second week of January 2003, the Philip Glass Ensemble is performing the sound track to Powaqqatsi shown on a cinema screen behind them. 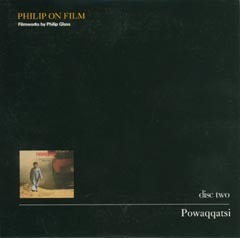 Powaqqatsi, directed by Godfrey Reggio, is a film I politely dislike perhaps because its referencing of ‘third world’ cultures and borrowing from these, by ‘first world’ music-makers, recalls irresistibly – for me at least – Edward Said’s work on ‘orientalism’; but it is hard not to find it musically interesting, not least in the context of the emergence of World Music. The Barbican theatre is completely full, and the audience falls partially silent when the Glass ensemble enters and entirely silent when Glass himself follows. It is hard, in writing, to identify atmosphere, other than metaphorically, using adjectives like charged, or electric, to attempt to conjure up a something beyond language. You may be aware that the soundtrack of Powaqqatsi includes some pre-recorded 'on-site' music elements as well as the ensemble's live performance. In one instance of playing a prerecorded component, the ensemble sits entirely still, as though suspended, for the full 3.23 minutes. Can I say, again, despite the limits of language, that there was a certain tension, once again 'in the air', in London in January 2003, at that moment when the US was preparing to attack Iraq with UK support? You may recall that fragments of the call to prayer had been repeatedly played on CNN, and elswehere, between 2001 and 2003, in conjunction with certain images, as part of what has been called a demonisation of Islamic traditional practices. 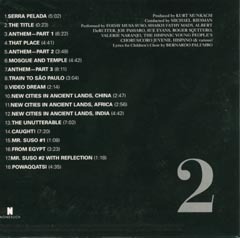 Track 16 on the recorded version is entitled "From Egypt". I wondered suddenly, in the Barbican concert hall, whether this piece of music had ever been played before in full in that setting, so that its musicality, rather than either its role in propaganda, or indeed its call to prayer, might be engaged with as such. The singer is anonymised – although I am supposing wholly professional or expert – on the Philip Glass CD. The call to prayer is simply represented by the title "From Egypt", amongst "Middle Eastern rhythms", and the programme refers to "over 90 musicians and singers", involved in the recorded soundtrack overall. But my feelings were not unambiguous, in the event, and they remain mixed: as Massumi has suggested, "experience in the event never stop[ped ]'streaming', and its streaming snowball[ed]", to include my sense that in terms familiar from post-colonial theoretics, there is a claim to be made that Glass has nonetheless misappropriated, decontextualized and recontextualized the call to prayer, amputating its everyday religious performative function – the modes of religious observation linked to it, retained, internalised and externalised by the believer; the somatic practices which accrue for believers, but also their complex affect. In music semiological terms, it might be possible, where Glass has quoted the full call to prayer, to argue that the spatial, temporal and actorial isotopies, so familiar and resonant for observing Muslims, were both retained and displaced. Substituted for them was something to do with Glass's own sensibilities, Glass's role as ambassador; Glass's "-etic" rather than "-emic" grasp of what he staged for those of us who are middle class British spectators, some of whom, in that particular audience in January 2003, were almost certainly opposed to the invasion of Iraq. Ambassadors are rarely ideologically neutral – whence my sense that this event was constitutively ambiguous, as well as a ritualised act of collective witness. In both of these events recalled, it seems to me, there are research questions to be asked about professional signature; in Brel there is a question about expert performer persona as a model of intelligibility. Why it is, after all, that, if from a spectator position, I can grasp those qualities in a performer which enable me to distinguish between the professional and the not-yet professional, or the never-to-be professional, I do not have any sort of analytical apparatus available which might allow me to locate the porous boundaries of music performance expertise in a somewhere of writing? I have already strayed into the area of expert or professional mastery, in these different samples, and in my reflections on them. I propose at this stage to turn briefly back to J-J Nattiez's John Blacking Memorial Lecture(8). I want to use this text as though it were indicative of writing of a generation of musicologists trained in the European mode, through literary and linguistic theory, in order to demonstrate what I take to be some of the shortcomings of that sort of project, now known by many with the benefit of hindsight as part of the 'linguistic turn' or the 'textual' or 'discursivist turns'. These shortcomings emerge with particular clarity when such a turn is directed, from within writing, at cultural practices which operate wholly or in significant part in an outside-of-writing. I want to begin with Nattiez's naming of subjects, processes and objects, within the clause, as a primary site at which 'something happens' which exposes the slipperiness of writing itself, in its relations with cultural practices outside of writing. Nattiez was explicit, in this paper at least, about what he termed the "fallacy of communication". You might recall that he has chosen a Peircian semiotic model to approach the analysis of music, on the basis in part, I'd argue, of Peirce's own early multi-disciplinarity, in place of the more widely dominant Saussurean linguistic model of signifier and signified, which continues to tyrannise writers like Hal Foster in the visual arts. I have also suggested that one of my difficulties with this sort of writing lies with the writer's propensity to draw on commonsensical metaphor at precisely those moments where that use of everyday metaphor quite precisely fails the terms of his own enquiry. Use of everyday spatialising metaphors – including "beyond", "behind", "beneath", and "underpinning" – is world-constituting. His "beyond" + "behind" + "beneath" function not simply to theatricalise "music", as his object, on an imaginary theatre stage; but his use of these spatialising metaphors implies that something else, in the theatre wings, is pulling music's strings – whether that 'something else' be "culture", in general, or "psychology", "biology", "sociology", or "neurology". In his use, "beyond", "beneath" and "behind" signal a multi-dimensional nowhere of music, determined always by something out of the writer's reach – so that the whole figures not just as a curious model of determinism, but a metaphysical model, at that. Nattiez had already worried me from the outset by his use of the term "music" itself, causing me to wonder exactly what he understands by it, and what an interested but non-specialist reader might grasp from the ways he uses it. This particular text uses the word "music" around 119 times. "Musics" appears two or three times; "musical" appears – including titles – around 95 times. If I remember correctly, "music-making" appears twice or three times. "Musician", by way of contrast – a gesture at least toward the expert practitioner – appears a meager five times. Nattiez uses the term "music" generally as object in his clauses, or in a prepositional phrase: "of music" appears multiple times, as in "aspects of music", "certain aspects of music"; "of reed-pipe music", "the power of music", "knowledge of music"; so too does that worrying "between music and culture", and so on and so forth. "Music"as subject, in Nattiez's clauses, figures only 14 or so times, out of the 119 uses I have counted. Curiously as in his "music 'speaks to me'", its role as subject is often constrained in quotes from other writers – e.g. McAllester, who writes "music transforms experience"; "Music takes one away into another state of being"; Merriam's enquiry into "how music works"; Seeger's observation that "most ethnomusicologists claim…that music is in some way related to the society that produces it" – almost as though Nattiez prefers to attribute observations as to music's functions elsewhere. Meanwhile the same noun figures as subject in only a few of the writer's ontologising clauses – that is, in clauses using the verbs 'to be' or 'to have', which serve to seem to conjure up being, as in the robust but generalising "Music is a product of man and has structure", as well as "music is the product of a specific culture"; in the negativised noun clause:"it is no longer feasible to assert that music is the exclusive domain of human beings"; in the very bald "music is a product of culture"; plus the technical "music is organised syntactically on the level of what music theory calls 'notes'". Curiously – or perhaps not? – the term "performance" only ever appears twice in Nattiez's presentation, in his quoting Blacking, and is not taken up by Nattiez himself as such. And finally, the terms "expert" or "professional", and the term "discipline" or "disciplinarity", with which I began today, are all absent from Nattiez's text. I have already hinted at some of my conclusions: they run along the lines that I still have not been able to discern what Nattiez actually understands "music" to mean, unless it is the anonymising and deprofessionalising "patterns of humanly organized sound" which he borrows from Blacking himself. Nattiez similarly quotes Leonard Meyer's notion, from the early 1970s, that a musical piece "is made up of parameters and constituent parts which, over the course of one and the same work, behave according to quasi-autonomous rules and functions": this produces what Nattiez calls his own "parametric conception of music", but does not seem to take us further toward an account of what it is in this elusive "music" that those who record music or use recorded music might want to capture. Nor finally do his musings, expert, technical, and to me very interesting, take me at any moment in the direction of an understanding of how we might account for music performance by professional musicians, or for precisely what an expert listener or spectator engagement in the event might entail. Yet I am persuaded, confronted as I am by this sustained erasure of 'performance', 'expert', 'professional', and 'event' from his lexicon, from his conceptual and writerly apparatuses, that it is nonetheless the case – ironically – that it is almost exclusively in terms of expert performance that he engages with music 'in the field', or in his use of recordings. His references, after all, ranging as they do from "opera", "Javanese gamelan", "a piece played on the Shakuhachi", "a disk of polyphonic or polyrhythmic pieces of …the Baganda", to "the music of Dave Brubeck", and indeed, to "a concert of traditional Japanese music", are implicitly concerned less with Blacking's "patterns of humanly organized sound" than with the work and indeed the mastery of specific, often signature, professional composers, performers, traditions, and events. M. Clayton, T. Herbert and R. Middleton (eds), (2003) The Cultural Study of Music. Routledge, New York and London. H. Dauncy and S. Cannon (eds.) (2003), Music, Popular Music in France from Chanson to Techno: Culture, Identity and Society, Aldershot: Ashgate. P. Ricoeur, (1970.) Freud and Philosophy. An Essay on Interpretation. Denis Savage (transl.). New Haven, Connecticut: Yale University Press. S. Rosenthal, (1986) Speculative Pragmatism, Illinois: University of Massachusetts Press. E. Said, (1978) Orientalism: Western Conceptions of the Orient, London & NY: Routledge and Kegan Paul. 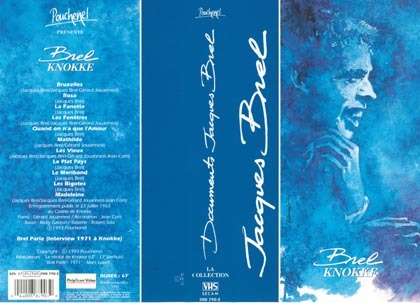 Background image: detail from cover of PolyGram Video Brel Knokke, © 1993 Pouchenel. Text last updated 15th April 2019.